A lot of people recommend using Ed25519 instead of RSA keys for SSH. So speaking only of security (not speed! 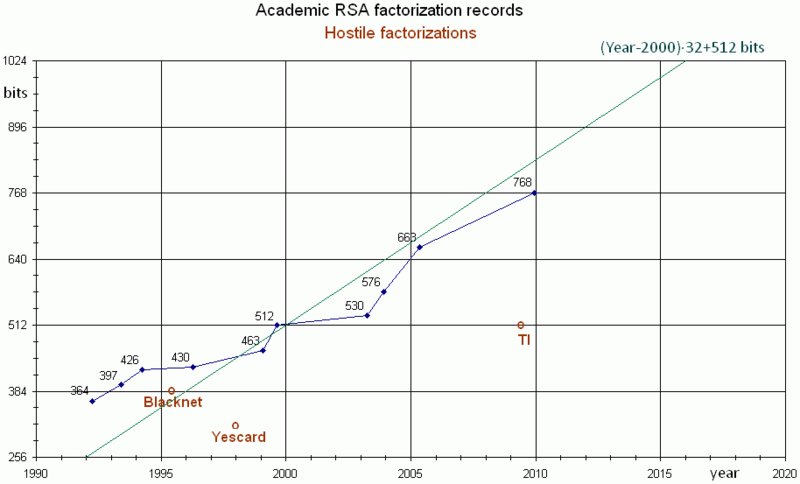 ), why should one not prefer RSA 4096 over Ed25519? If Ed25519 only provides ~3000 bit key strength, RSA with 4096 bit should be much more secure? Key strengths, and their equivalences, become meaningless when they reach the zone of "cannot be broken with existing and foreseeable technology", because there is no such thing as more secure than that. It is a common reflex to try to think of key sizes as providing some sort of security margin, but this kind of reasoning fails beyond some point. The bottom-line is that while a larger key offers longer predictable resistance, this kind of prediction works only as long as technology improvements can be, indeed, predicted, and anybody who claims that he knows what computers will be able to do more than 50 years from now is either a prophet, a madman, a liar, or all of these together. 50 years from now, the optimistic formula given in the answer quoted above ((year - 2000) * 32 + 512) means that, at best, RSA records could contemplate approaching 2592 bits. The conclusion is that there is no meaningful way in which 3000-bit and 4000-bit RSA keys could be compared with each other, from a security point of view. They both are "unbreakable in the foreseeable future". A key cannot be less broken than not broken. An additional and important point is that "permanent" keys in SSH (the keys that you generate and store in files) are used only for signatures. Breaking such a key would allow an attacker to impersonate the server or the client, but not to decrypt a past recorded session (the actual encryption key is derived from an ephemeral Diffie-Hellman key exchange, or an elliptic curve variant thereof). Thus, whether your key could be broken, or not, in the next century has no importance whatsoever. To achieve "ultimate" security (at least, within the context of the computer world), all you need for your SSH key is a key that cannot be broken now, with science and technology as they are known now. Another point of view on the same thing is that your connections can only be as secure as the two endpoints. Nothing constraints your enemies, be they wicked criminals, spies or anything else, to try to defeat you by playing "fair" and trying to break your crypto upfront. Hiring thousands upon thousands of informants to spy on everybody (and on each other) is very expensive, but it has been done, which is a lot more than can be said about breaking a single RSA key of 2048 bits. Not the answer you're looking for? Browse other questions tagged cryptography ssh rsa ecc or ask your own question. What are the possible ways to manage gpg keys over period of 10 years? ECDH is better than plain RSA?